The beginnings of Door County tourism preceded the cherry industry boom by several decades. The natural beauty and cool temperatures made it an attractive destination for urbanites in search of a respite from the summer heat. As transportation improved, visitors from Chicago and Milwaukee regularly arrived in Door County via steamships. However, cherries provided a countywide marketing opportunity, and as the success of Door County cherries grew, so too did the idea to take advantage of it through cherry tourism. A c. 1920 postcard with cherry illustrations and the Cherryland nickname. Photograph courtesy of the Wisconsin Historical Society. Image ID: 38328. 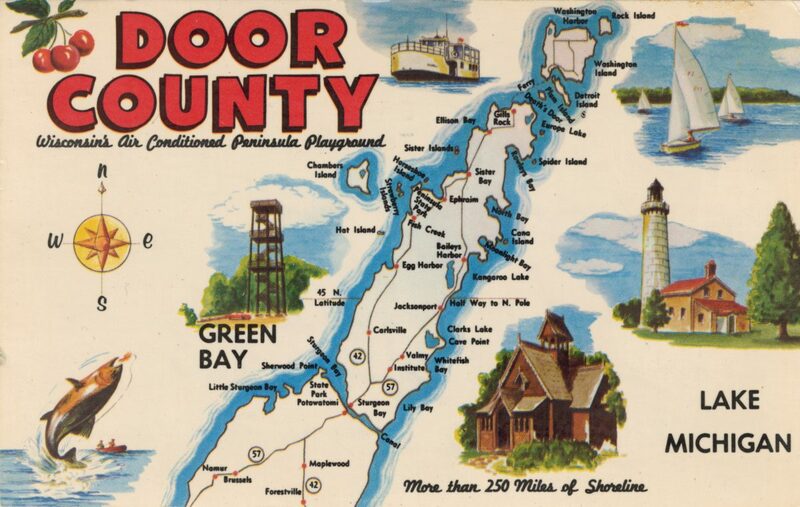 In 1927, the Door County Chamber of Commerce began producing stickers emblazoned with “Cherryland–Door County, Wisconsin.” These stickers were widely distributed across the county, and marked the beginning of a cherry tourism boom. Through events, festivals, and cherry products like the Cherryland T-shirt, Door County capitalized on the Cherryland nickname. Cherryland promoted the natural beauty of the cherry orchards, and the annual blossoming of the trees proved a popular tourist draw. Photograph courtesy of the Wisconsin Historical Society. Image ID: 94781.
chosen annually, as well as a Pie Baking Queen. In 1928, the Door County Cherryland Airport in Sturgeon Bay opened, due in part to the large crowds expected for that year’s Cherry Blossom Festival. As the term Cherryland grew in popularity, its usage extended far beyond the cherry industry. The Cherryland Open, a popular golf tournament which attracted amateurs and professionals alike, began in 1956 as a way to extend the tourism season past Labor Day. At its peak, 200 golfers participated in the tournament. Door County residents also embraced the term Cherryland, incorporating it in the naming of local organizations and businesses, like the Cherryland Horsemen and Cherryland Transport. It also proved useful in business marketing. Al Johnson’s Swedish Restaurant in Sister Bay, famed for its goats on the roof, declared itself “In the heart of Cherryland” in newspaper advertisements during the 1950s. By the 1960s, both cherry growing and cherry tourism diminished, though cherries continue to draw visitors to Door County. Today, the county has approximately 2,000 acres of cherry trees and at least eleven active orchards. “C.C. Advertises “Cherryland” By Using Stickers,” Door County Advocate, August 5, 1927, 1. Jo Anne Gilbert, “Apples Started Fruit Industry,” Door County Advocate, October 21, 1958, 18. Katie Dahl, “Where All the Beauty Is,” Door County Living, 2009: https://doorcountypulse.com/where-all-the-beauty-is/. Al Johnson’s Swedish Restaurant Advertisement, Door County Advocate, August 23, 1956, 1. “Apple & Cherry Orchards and Farm Markets of Door County,” Door County Visitor Bureau. Featured image: Image courtesy of the Wisconsin Historical Society. Image ID: 112459.